Our high quality affordable RollerTrol™ blind, shade and drapery systems with state-of-the-art remote control capabilities are precision engineered, safe for children and adults, and easy to use. We ship all across Washington. If you're handy with tools you can save money with a DIY package you can install yourself - delivered to your door. If you need assistance with the tricky bits, our support staff is there to help. 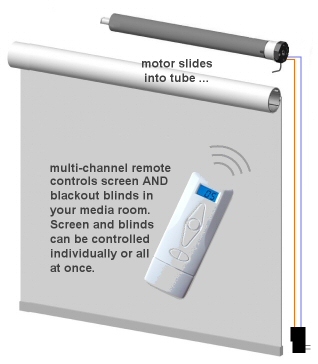 Visit the RollerTrol website for more DIY information about motorized blinds, articles and online store. Our motors are perfect for making custom remote control window blinds, sun shades, skylight shades, solar shades, blackout shades, projector screens, or any other application where you need a rotating tube or a remote control motor. We also have motorized window and skylight openers, bottom-up cellular shades, pergola covers, and many other automation solutions for your home and office. You can start with our simple hand held remotes to control our radio motors, and later add on a full home automation system for our radio motors, allowing control by any web enabled device (phone, tablet, PC, etc) - at home or away.